Prophecy™ is a comprehensive, multi-user volume and financial forecasting solution, containing much more than statistical sales forecasting features. However, if you are interested in Prophecy's statistical sales forecasting options, this page is definitely for you! Prophecy has had a built-in statistical forecasting engine from day 1, covering core time-series modelling without the need for statistical knowledge. 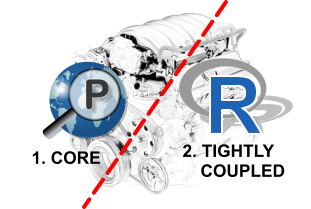 The core engine is described on this page. 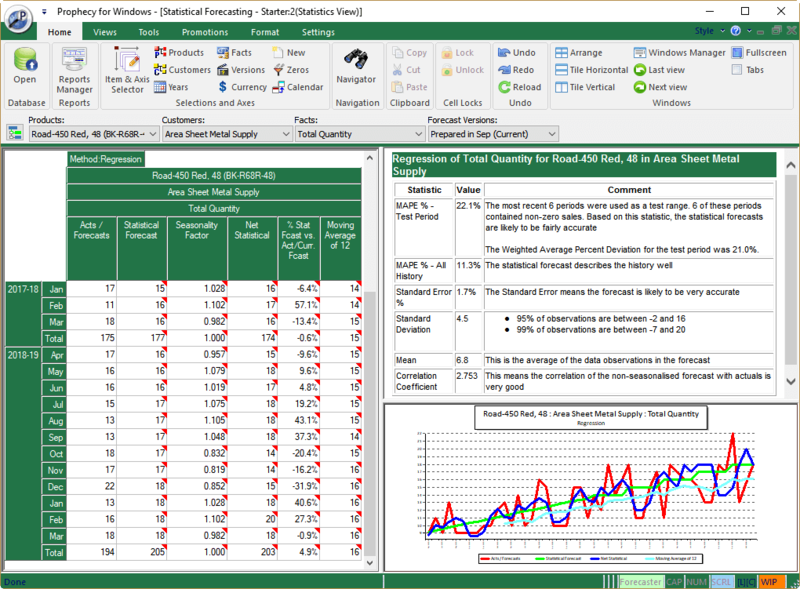 From Version 11 (January 2019), Prophecy added a tight and transparent integration with the Microsoft R Open environment for statistical computing. This innovation opens Prophecy up to applying state of the art automatic forecasting algorithms, developed by renowned academic statisticians, to Prophecy data in 'Automatic' or 'R Expert' mode. Please click here for more information on Prophecy's integration with R.
Supported Statistical Forecasting Algorithms in Prophecy. Linear Regression: A linear regression analysis draws a straight line of best fit through the historical sales. Exponential Regression :Similar to linear regression, but works with the logarithms of sales, resulting in a ‘bendy’ line. Holt Winters : An extension of the exponential smoothing method. Consists of an exponentially smoothed component and a trend component. This method is claimed by statisticians to better reflect long term trends than simple exponential smoothing techniques. Last Yr + YOY% : This method is proprietary to Prophecy and takes the actual sale for each period in the previous year, and increases/reduces it by the latest complete year over year (‘YOY’) percentage. This is a simple method for populating a new year with data, where the peaks and troughs in the forecast can be clearly understood by matching them to the corresponding period in the previous year and it also reflects the most recent year on year trend. These methods will typically produce a good statistical forecast in the majority of cases. Data Perceptions analysis comparing the accuracy of these methods with more sophisticated time series algorithms, using real-world customer data, suggests that accuracy does not noticeably improve with statistical sophistication. Prophecy now also offers full and transparent integration with the R framework for statistical computing and therefore allows users to choose from basic to leading-edge forecasting models, depending on their preferences and what they discover from applying the various methods to their data. Prophecy™ make the sales forecaster fully responsible for their forecasts and statistics is just one tool they can use to help them develop more defensible sales forecasts. Therefore the 'engine' appears in several places in Prophecy, but the human forecaster is always fully responsible for choosing whether to apply the forecasts that are generated. The Batch Statistics Wizard uses 8 steps, allowing you to automatically exclude outliers, discard forecasts where the test interval MAPE is outside a set limit, reject negative forecasts etc.. 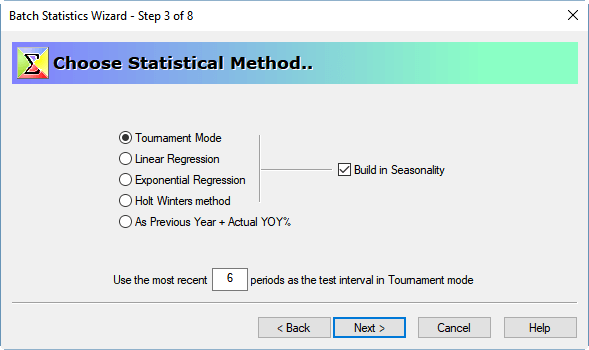 The 'Tournament Mode' option forecasts the most recent <n> periods, using all the remaining history and chooses the method that has the lowest MAPE over the test interval. 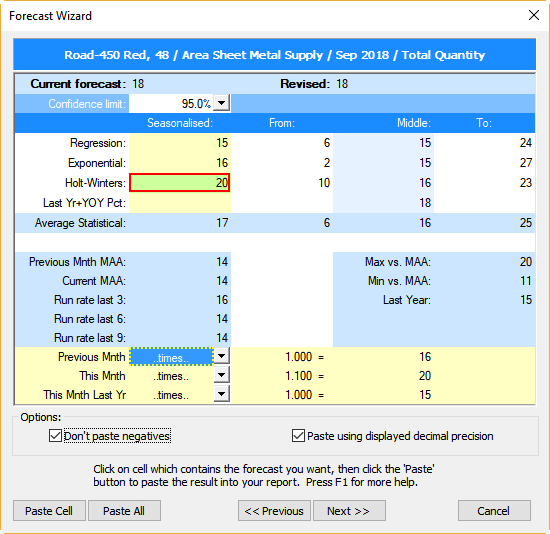 This option lets the forecaster see a statistical forecast for the item at the current cursor position in their Prophecy forecast update and report screen, in a separate window. The window is refreshed in real time for the item at the cursor position as the forecaster navigates from cell to cell in their main Prophecy forecasting report screen. Forecasters can compare their current forecast with the statistical forecast and decide to replace some or all of the current forecasts with the statistical forecasts. The Prophecy™ Advisor is an 'expert system' that runs in the background and constantly evaluates your forecasts, as you enter them. It pops up a message if it detects that a forecast has been made which is outside previous historical experience. Note that, (a) the automated appearance of the 'Advisor' can be suppressed if desired and (b) forecasting outside previous history is not necessarily wrong. Although it is surely a good thing to be warned of it! Prophecy's Sales Forecasting Accuracy Report uses the statistics engine to compare the official forecast in Prophecy with the forecast that the statistical engine would have used. This lets forecasters easily quantify the 'added value' of their forecasts versus the statistical engine. Prophecy™ strives to imaginatively use statistical forecasting as a forecasting aid for the forecaster and not as a replacement. It is not a 'black box' and the forecaster is always in control of their forecasts.